﻿ How to recover lost data with a file recovery software after deleted partition accidentally? Position: Home > Hard disk format recovery > How to recover lost data with a file recovery software after deleted partition accidentally? Sometimes data on the partition, hard drive or logical drive might lose or cannot be recognized. We know that whether partition can be recognized by system or not depends on the partition table. If the partition table is destroyed by virus or deleted accidentally, you will not see the files you need. If there are important data in the partition, how do you restore it? How to recover lost data after deleted partition accidentally? Another major reason for partition loss is partition table corruption. The partition table is a kind of system file which contains critical information about the hard disk drive partitions, including the start point and end point of hard disk drive partition, file system, name, size and other important information of hard disk drive partition. If one of hard disk drive partition is lost, how to restore lost hard disk drive partition becomes urgent. However, we need to know that the partition is not actually lost and we need a professional file recovery software to find it and restore its data after deleted partition. Bitwar Data Recovery is a powerful data recovery tool that you can use to recover files from lost or deleted partition. It fully supports all Windows systems such as Windows 10 /8/7 etc, and you can restore whatever you've lost from the lost hard disk drive partition. You should restore lost data firstly and then create a new partition on Windows. Restore all your lost data from the deleted disk partition by Bitwar Data Recovery. Go to Disk Management > Right-click unallocated space on your computer (which as previously the deleted partition) and choose Create new volume > Specify the size of the new partition and click Next > Finish. After creating a new partition, you can reuse it to store data again. Step 1: To launch Bitwar data recovery program on your windows and select “Lost Partition Recovery” at standard mode when you want to recover data from the lost partition. Step 2: Select the lost or deleted disk partition from which you want to recover data and click Next. If you can not find lost partition you want to recover, please click“Deep Scan”, the deep scan will automatically start to find more hard drive partition data. Select a hard drive you want to deep scan and click "Next" to start search lost partition. Step 3: Select the types of files which you want to recover and click "Next". 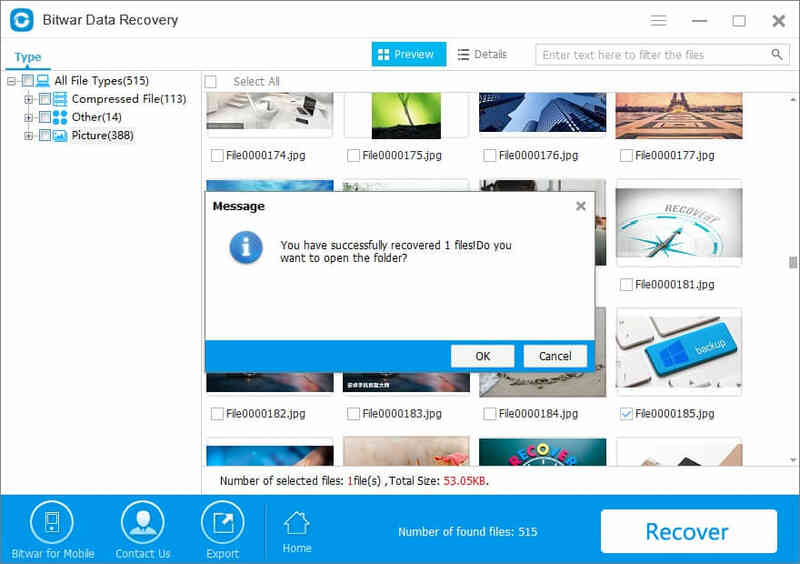 Bitwar Data Recovery is a safe and effective data recovery software, you can retrieves all types, including Images, photos, Audios, Videos, Documents, Compressed Files and other types of files. When you click next, The software will quickly scan the selected criteria to find all target files. Step 4: After the scan is completed, Files to be scanned will be listed out. You can preview them to make a selective recovery. 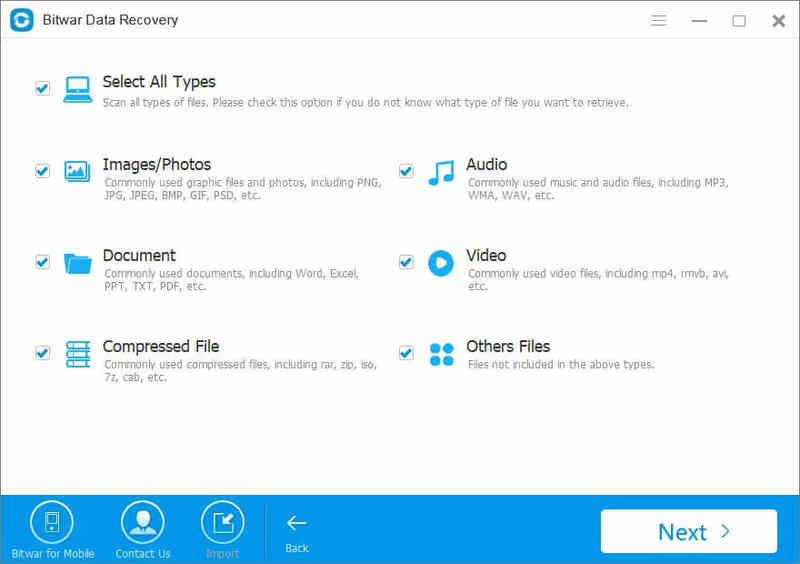 Select the file what you need and click "Recovery" , save them to another partition or external device. Following these steps, the data has been recovered from the deleted partition. Next, you can create a new partition to store the data again. Next：HDD recovery software, did you pick the right one?